In 1911, a one-track suspension bridge was constructed over the gorge of the Little Colorado River, bypassing a treacherous river crossing and opening travel to northern Arizona. Five years later, Hubert Richardson built a tin-roofed shack on the river's rim and opened his trading post for business. In the first years, almost all of his customers were Navajo, but with the new bridge travelers soon found the area, and it became the access point for the Grand Canyon, Glen Canyon, and the Four Corners area. 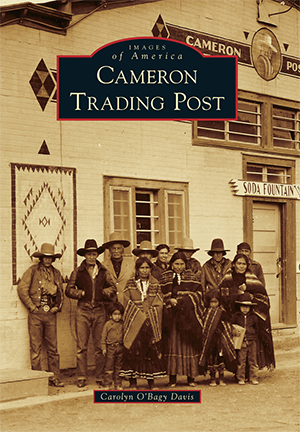 A century later, Cameron Trading Post is a thriving epicenter still serving Navajo people, tourists, and an impressive list of the famous and fascinating, including authors, scientists, and movie stars. Boasting a curio store, gas station, motel, RV park, grocery store, and art gallery, Cameron is visited by guests from all over the world. It is a crossroads and a destination for visitors to this historic trading post. Carolyn O'Bagy Davis, a descendant of Utah pioneers, has been writing about the American Southwest for 30 years. Davis is a historian and the author of 14 books on Western history. The people of Cameron and Western-history lovers shared information with Davis for this centennial volume.